SURIGAO Today: It’s grand slam for PPA-Surigao! It’s grand slam for PPA-Surigao! THE BIG FOUR behind the grand slam victory of the port community led by Philippine Ports Authority-Surigao’s official entry to the “Float Parade Competition during the 43rd Charter Day of the City of Surigao on August 31, 2013. From left: Engr. Carmelito “Boy” Abitona, Engr. Allan Yap, PP/Supt. Froilan “Al” Caturla and Port Manager Engr. 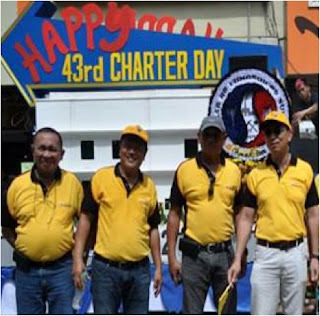 Isidro Butaslac, Jr.
SURIGAO CITY - For the third time in a row, the port community led by Philippine Ports Authority snatched the top prize in this year’s Float Parade Competition during Surigao City’s 43rd Charter Day celebration on August 31. PPA’s entry was a crowd-drawer where people pose for picture-taking as they were amazed of it’s design and rendition of the “Bayanihan Spirit” as depicted by ‘representatives’ of national and local agencies behind the backdrop of City Hall’s replica. During its final presentation when the PPA float was approaching the City Hall’s frontage area where local officials were seated, City Mayor Ernesto Matugas suddenly made a standing ovation and a loud applause which was followed suit by city officials, employees, policemen and the cheering crowd. For its feat, PPA-Surigao’s entry bagged the top prize followed by DepEd Surigao City Division and SMWD for the second and third prizes, respectively.